A deliciously refreshing Pinot Grigio from the northeast of Italy with a lovely floral aroma. Masses of fresh fruit flavours on the palate and a rush of citrus acidity make this wine perfectly balanced and totally refreshing. An elegant style of wine which is ideal on its own or with creamy pasta sauces, fish dishes or white meats. Wine of Italy. An elegant dry wine with floral notes and fresh flavours which provide a refreshing crisp finish. 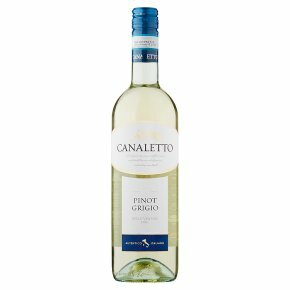 Canaletto Pinot Grigio comes from Veneto region, in the north east of Italy, home to Venice and Lake of Garda. This elegant wine is ideal on its own, or with creamy pasta sauces, fish dishes and white meats.